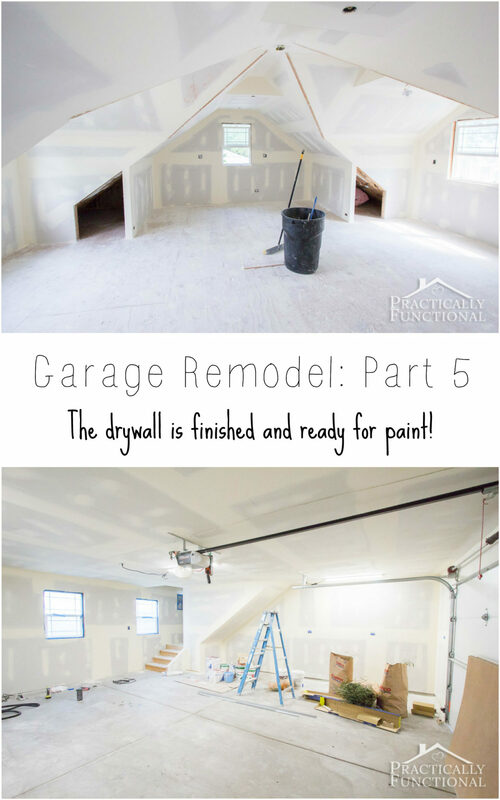 Home > Projects > DIY > Garage Remodel Progress: The drywall is finished and ready to paint! We’re making serious progress on the garage remodel! 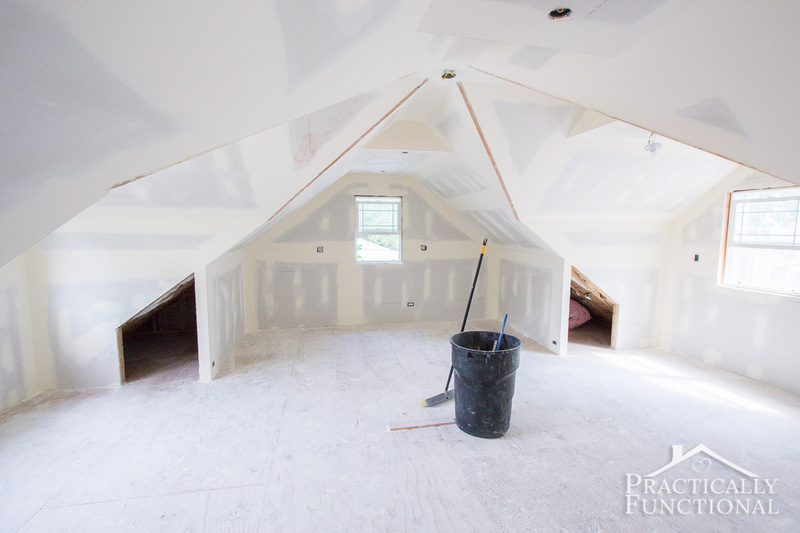 The drywall guys finished up last week, and everything is now ready to paint. Once we get everything painted, our contractor will come back and install a few light fixtures for us, and then the rest is DIY work. My dad and brother are coming out in about a month to help finish up the space, and I can’t wait! Plus, once the paint is on the walls upstairs I can start moving my craft room into the garage and out of our extra bedroom, and then I can finally get started on the nursery. There are only 63 days left until this baby arrives, so I gotta get moving on that! 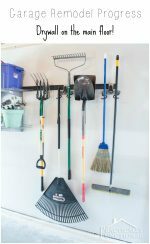 I can’t even tell you how excited I am about this garage space! And I’m excited that my family is willing to help me out with it, because as soon as I hit the third trimester of pregnancy, I totally understood where all the stereotypes came from. 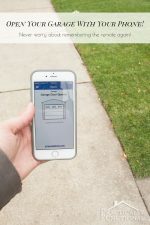 I had all this energy and motivation during the second trimester when we started this project, and about two days into the third trimester I was exhausted, my back hurt, and my feet were so swollen I had permanent fat creases in my ankles! Blech. My dad told me not to freak out once the drywall was in place, because a lot of times the space tends to look smaller. And he was totally right! For some reason the craft room space upstairs looks really small to me now. I think it’s because everything is the same color and it’s totally empty, and without furniture I have no sense of scale. 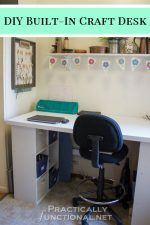 But when I really think about it, the craft desk I built a few years ago would fit twice against the wall in one of these bays, and in my current craft room it takes up the whole wall and the door to the room just barely opens without hitting the end of it! So I’m sure once I start moving the furniture in, it will look a lot bigger again! I love how the ceiling turned out upstairs! Our contractor managed to keep as much height as possible while still leaving room to run a bunch of electrical wires and keep them hidden as well. So we lost a bit of height against the walls, but the middle point still reaches full height, which is awesome. And look how much light comes in these windows! I have plenty of light sockets in the ceiling just waiting for lights, but natural light is always better for photographs anyway, so I’m thrilled to have a ton of sunlight coming in the windows during the day. The little storage bays aren’t quite done yet, but we’re getting there. Our contractor is going to put up a few sheets of masonite on the walls inside the storage areas to cover the insulation, but we’re not planning to paint or put flooring in there. Once my dad gets here we’ll build a few custom doors to put on the front so we can hide the stuff from view when we’re not using it, but for now it’s just a nice big triangle-shaped hole! 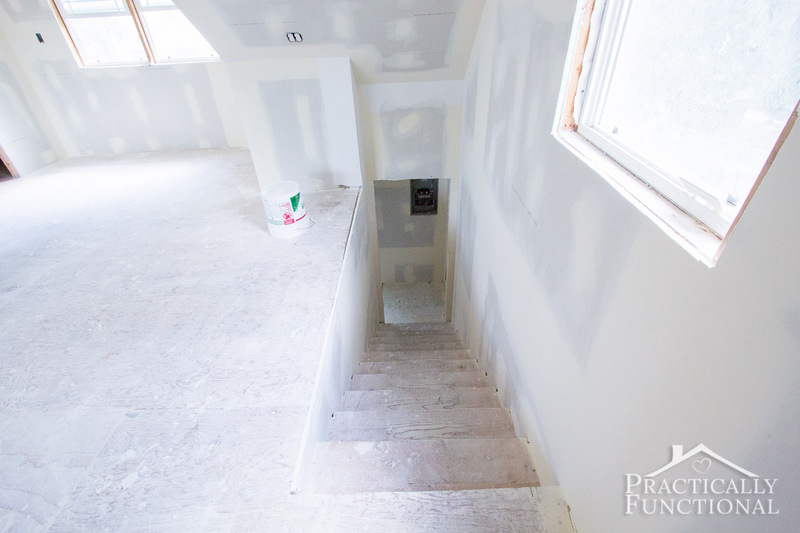 The stairwell and landing is ready for paint too! 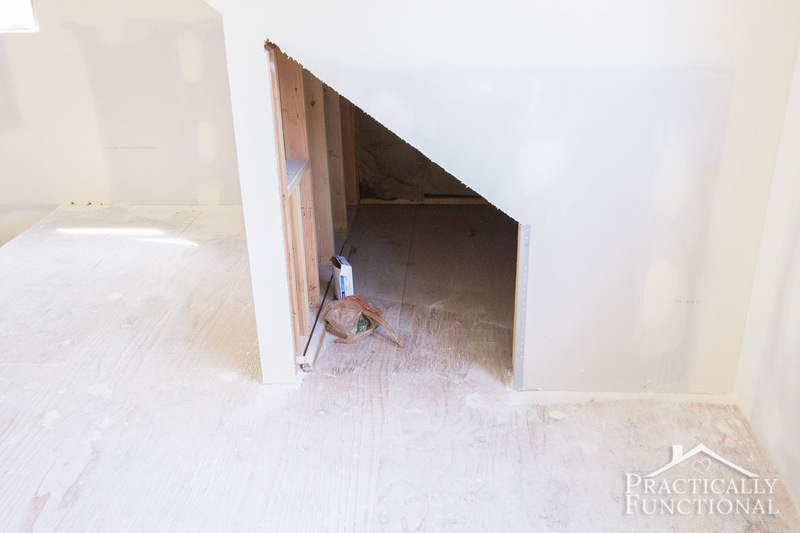 Our contractor framed in a door at the bottom of the stairway so that we can heat and cool the upstairs floor separately from the main floor. The drywall downstairs is also completely finished and ready for paint! It will be so nice once this floor is painted so we can start moving some stuff back into the garage and parking in there again! Even if the trim isn’t finished and I haven’t made the workbench yet, once the paint is done we can start adding shelving and storage to the walls and the space will start to be functional again. I will keep updating as we make more progress. 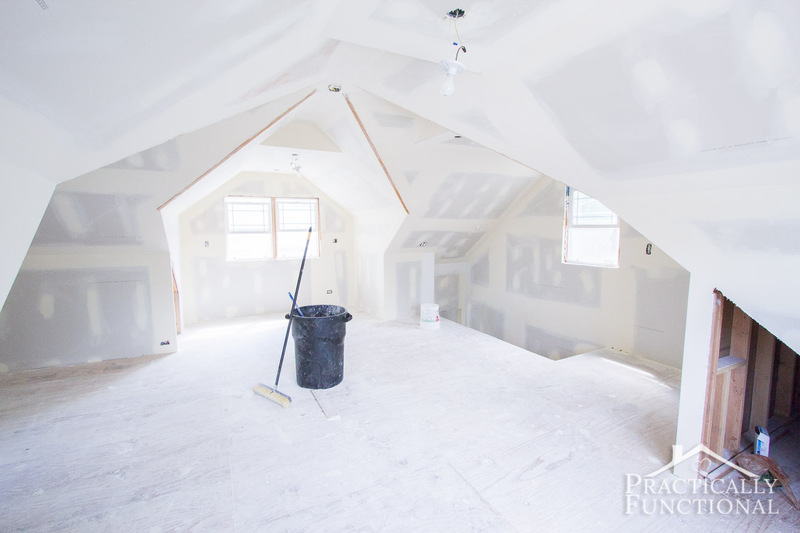 Painting is the next step, and then we get to do all of the other DIY parts like flooring and trim, so check back for tutorials on all of that once we get started! 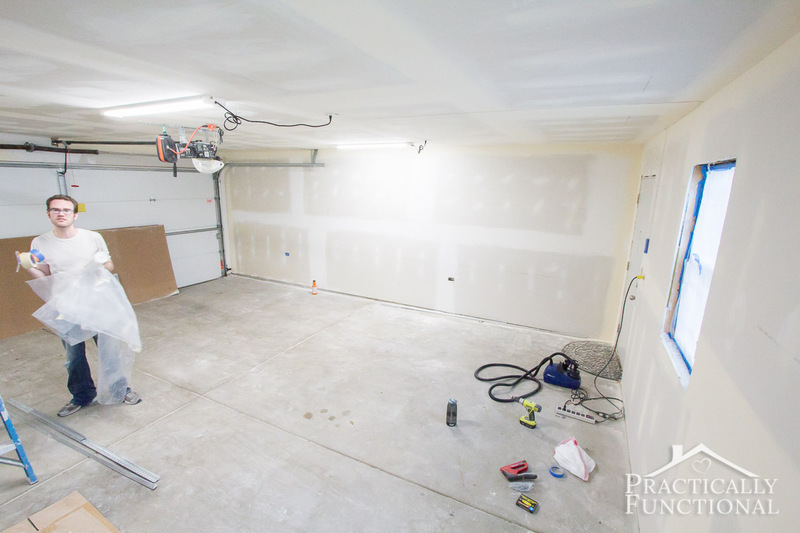 Garage Remodel Part 5: The drywall is finished and ready to paint! 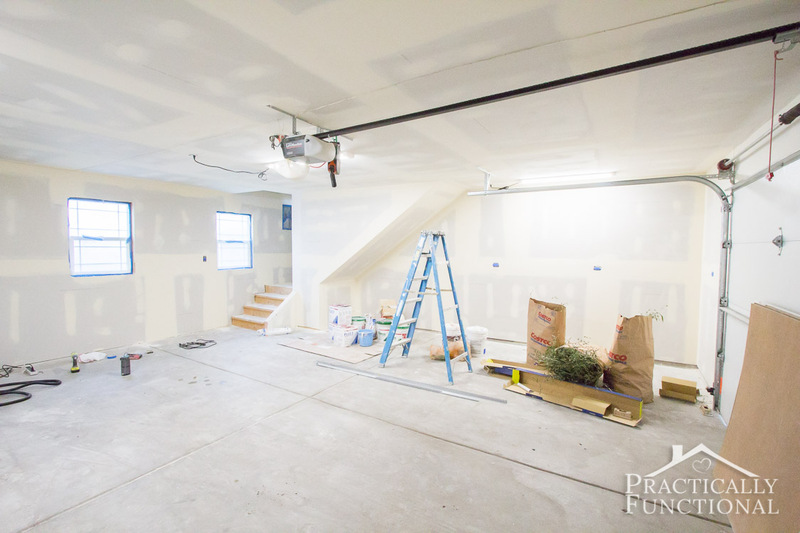 Garage Remodel Progress: Drywall On The Main Floor! 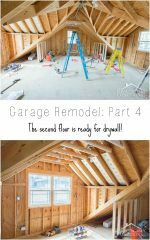 Garage Remodel Plans: The Second Story Before! 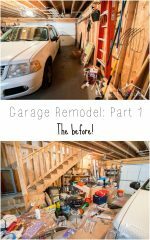 Garage Remodel Plans: The Before! « Make Your Own Lego Brownies! What a great job you are both doing. 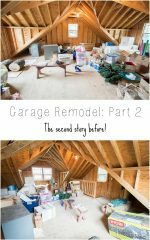 I’ve just spent about an hour looking through all your ‘before/during/after’ photos/folders – I’m a sucker for d.i.y. (at least I used to be) so I’ve loved looking at everything you’ve both achieved. Thanks so much Lesley! I’m really thrilled with how it’s coming along, and we’ve been painting this week, so there will be another post coming soon!